Modern data backup solutions must provide faster and automated application protection, give insight into large, complicated virtual environments and provide the foundation for partners and vendors to deliver backup-as-a-service (BaaS). Symantec’s NetBackup (NBU) 7.6 delivers just that, ensuring that organizations will have a modern software-defined and secure data environment. Instant recovery allows users to immediately restore a virtual machine into production by mounting a virtual machine image from a backup file without having to extract the virtual machine from the backup file and copying it back to production. This means much greater availability of your virtual servers and information–and much less downtime – saving you time and money. While other backup and recovery software can support instant recovery, Symantec NBU 7.6 can reclaim virtual machines 400% faster. NetBackup Accelerator, which was introduced in NBU 7.5, provides full backups at the price of performing an incremental backup. Accelerated backups only back up your changed data, but then gives you a full backup recovery point using optimized synthetics. One of the major upgrades with Symantec NBU 7.6 version is that it now supports VMware by integrating with changed block tracking, and handles backups 35 times faster than version 7.5. This new feature is particularly beneficial for customers who have NetApp filers. Symantec has added support for snapshots of virtual machines on NetApp arrays with its Replication Director for VMware. This allows you to leverage array-based snapshots to protect your virtual environments, without giving up any level of recoverability. It also simplifies and accelerates snapshot replication management and recovery to help decrease OpEx and enable granular recovery to help meet SLAs. Symantec NBU 7.6 allows customers to protect 300 virtual machines in five minutes. Upgrading to Symantec NBU 7.6 will ultimately provide your business with faster backup, faster recovery, and simplified data management. 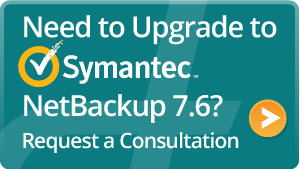 To learn more about Symantec NBU 7.6, and its other great capabilities, request a consultation with Dewpoint.